According to Bhullar 2017, certain supplements are needed to restore Inuit back to health.
" Currently, the Nunavut�s Inuit population suffers from the severe deficiency of vitamins, minerals and dietary antioxidants including vitamins A, folic acid, C, D, E, riboflavin magnesium, fibre n-6 fatty acids, and calcium [6,7]." Conclusion: The lack of nutrition among Inuit leads to primary and recurrent TB infections. This commentary recognizes malnutrition and compromised nutritional status as a cardinal feature of TB epidemiology and strongly advocates the initiation of a program targeting this risk of TB. In Canada, some of these supplements are available free-of-charge for residents. Usually an insurance card is needed (such as NIHB) and a doctor, who will send in the paperwork, and supplements are picked up at the pharmacy. A simple process. What if more Inuit were able to take advantage of this system? Bhullar 2017 states " Currently, the Nunavut�s Inuit population suffers from the severe deficiency of vitamins, minerals and dietary antioxidants including vitamins A, folic acid, C, D, E, riboflavin magnesium, fibre n-6 fatty acids, and calcium [6,7]." The Dr Hoffer Protocol includes a number of the vitamins and supplements. New Treatments Initiated by Pharmacists To improve client access to benefits, NIHB has added new products and medications to the list of non-prescription (over-the-counter) benefits that can be prescribed or recommended by pharmacists: Acne medications Medications to treat eye or ear infections Vitamin D or multi-vitamins for children Treatments for fungal skin infections Diabetes devices Blood glucose test strips You can find a complete list of eligible products and medications that can be prescribed or recommended by pharmacists in the NIHB Pharmacy Benefit Guide. 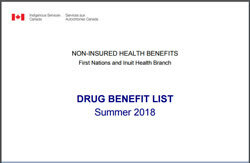 "In 2014, the federal Minister of Health and the Grand Chief of the Assembly of First Nations announced a full-scale review of the NIHB program. The purpose of this review, which is expected to last until 2017, is to conduct a thorough examination of NIHB operations and policies with the expectation of significant program reform. In spring 2015, the working group tasked with conducting this review (comprising representatives from AFN and the First Nations and Inuit Health Branch of Health Canada) issued a Critical Path document identifying the major sectors and issues that the review will address; pharmacy has been identified as one of the key sectors slated for specific examination starting in December 2015." In 2014, after significant efforts from the Assembly of First Nations (AFN) and First Nations leadership, the Minister of Health agreed to a joint review of the Non-Insured Health Benefits (NIHB) program conducted in partnership between the Assembly of First Nations (AFN) and the First Nations and Inuit Health Branch (FNIHB) who administer the NIHB program. The Joint Review began in earnest in September of 2014 with a meeting of the Joint Review Steering Committee (JRSC) to guide the Joint Review process. This group is made up of equal representation of First Nations and FNIHB staff including two Deputy Ministers with the authority to make program changes. The group is collectively guided by an Elder. Enhancing client access to benefits; Identifying and addressing gaps in benefits; Streamlining service delivery to be more responsive to client needs; and, Increasing Program efficiencies. As shown in the critical path, the Joint Review is expected to take 2 years ending in March 2017. Each benefit area will be examined separately and will result in an individual report; further, the Joint Review will result in a final report bringing together the complete findings and providing recommendations of the Steering Committee. Due to the size of the program, the Joint Review will examine the program area benefit area by benefit area. The review of the Short Term Mental Health Crisis Intervention Counselling (STMHCIC) was the first benefit to be reviewed, the review of the Dental Benefit is currently underway.